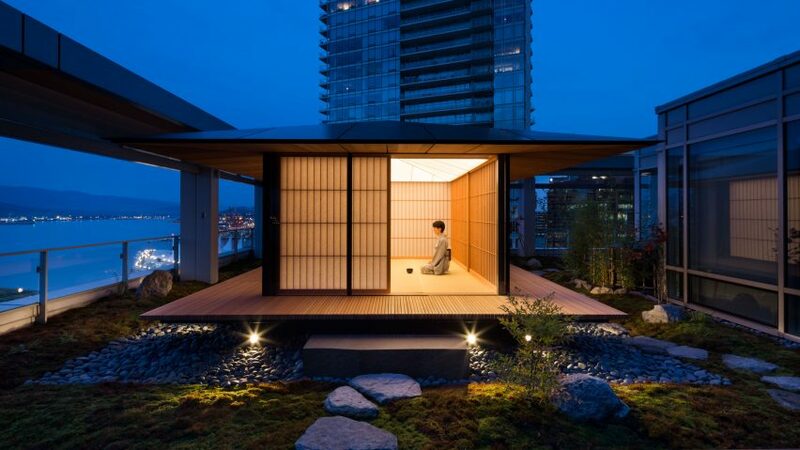 Japanese architect Kengo Kuma has designed a pavilion for hosting traditional tea ceremonies on the deck of a Vancouver tower, coinciding with an exhibition of his work across the street. Kuma's teahouse is installed on the 19th floor of Shaw Tower, on the terrace of a show apartment that overlooks both the city's Downtown district and the bay. Surrounded by stones, the wooden structure features sliding glass walls and a low-slung overhanging roof. Inside, a central table on hydraulic supports can be raised for users to sit around, and lowered when necessary. Its installation ties in with an exhibition at the Fairmont Pacific Rim hotel, located across a small plaza from Shaw Tower. Titled Japan Unlayered, the show provides a retrospective overview of Kuma's work through photographs and study models. Another of the architect's teahouses, the Floating Teahouse, is installed in the hotel lobby. It is formed from a curtain of organza fabric draped over a translucent helium balloon. Also as part of the programme, a pop-up store for Japanese brand Muji – its first retail outpost in Vancouver – is set up off the lobby. The wooden stands were designed by Kuma to display the minimal products, which includes items by Naoto Fukasawa. In the cafe, Japanese design store Beams is selling a curated selection of its craft-oriented products. Other Japan-related artworks are scattered throughout the hotel's public spaces. The exhibition – on show until 28 February 2017 – and the teahouse were planned by local property developers Westbank and Peterson Group, to celebrate Kuma's residential skyscraper planned for the city. Alberni by Kengo Kuma will be the architect's first tower in North America. It is set to rise 43 storeys in the West End neighbourhood. The building is distinguishable by its two concave sides, which give it a curvaceous profile. Kuma's other projects on the continent include the expansion of Portland Japanese Garden, which is due to open in April 2017.